We went to a food court just near our hotel after exploring the town square – and after all that walking we were famished. Before I get into each dish we ordered, let me say something about Malaccan food in general. I don’t think my brain’s ever released as much pleasure chemicals or endorphins as it did when I was gettin’ my eat on in Malacca. 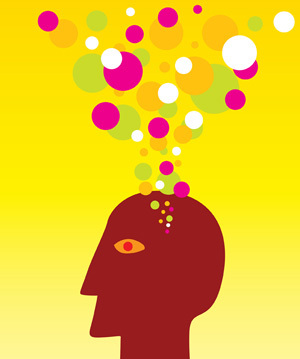 Every dish I ate gave my tastebuds a new gastronomic experience, awakening new regions of taste in my tongue, and sending me down a path of hedonistic pleasure. You can get Mee Siam anywhere in Malaysia really. I had it once in Kuala Lumpur – it wasn’t too memorable. But this – THIS Mee Siam? THIS Mee Siam right here? INSANE! 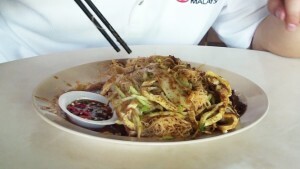 Mee Siam is stir-fried noodle dish. It’s made with Vermicelli noodles and cooked in a sour, yet sweet, yet tangy, yet spicy sauce. Read more about mee siam and see me try it out here! I squeezed a lime all over the dish (something that you do A LOT over here), and when I took that first bite – my heart was singing Paul Anka’s “Puppy Love”. The flavours all harmonized beautifully. Eating a bit of noodles and then biting into an egg or a slice of chicken mellowed the tanginess of the sauce, enough to allow the flavours of the toppings to shine through and reveal a new flavour entirely. It was truly an exquisite dish. Bak Kuh Teh literally means pork bone tea. It’s a soup boiled with pork bones for hours and hours until the soup itself becomes an extension of the bone. The broth absorbs all the subtle and wonderful flavours of the pork bone and all that slow cooking makes the meat SO SOFT…it just fell off the bone and disintegrated in my mouth. It was a really nice dish and a true testament to Malaysia’s cooking prowess. 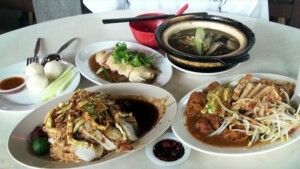 Read more about Bak Kut Teh and see me try it out here! I’m not sure if it was actually a windpipe, however I would gladly take windpipe over any other part of a pig that it might have came from. This is the Rojak I got, so let’s go down the list and see if we can’t decipher what’s in it. F. Gravy – a rich, sweet and savoury concotion that brings everything together. So about the *???? * ingredient. I can only describe it as fried dough or bread of sorts. But hey, I love dough, I love bread, I love fried stuff; fried dough/bread? Hales yea! The best part about it was that it was crispy and chewy, and you see that gravy? It was sopped up, so I had an explosion of gravy in my mouth with each bite. Awesome. The satay in Malaysia was generally very good. To be fair, I only have the satay back home in Canada to compare it to. However, of all the satays I’ve eaten in Malaysia, Malacca came out as the clear winner. Tender…smokey…juicy…a hint of crisp at the end pieces….HAVE MERCY…(yes that was a Full House, Uncle Jesse reference). I’m pretty sure somebody will tell me that better Satays exist somewhere else in Malaysia, since Malacca probably isn’t known for their satays, but to an ignorant Westerner it was sublime! We’ve reached the end of my journey to through the heavens of taste and delight. 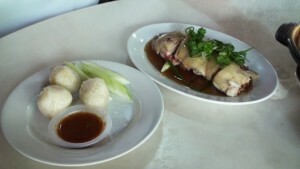 Of course, I save the best for last – Malacca’s famous Chicken Rice Balls. Read more about Malacca’s Chicken Rice Balls here and watch the video! A few minutes please….to compose myself before I even attempt to describe this. On your left, there’s a litter of Daschund puppies (the weiner dogs) each representing a different flavour. Each one represents a flavour (ginger, green onion, soya sauce, chickeny-goodness, etc). They even have little collars and dog tags with their respective flavours engraved on them…aww. To the right, there’s a litter of Pug puppies, each representing non-flavour based attributes like texture, tenderness, aroma, etc. I think one is just pure “Love”. The puppies are playing Battleship, the classic game of naval strategy. However, the puppies recieved a version where there was a surplus of ships. So all the ships are laid out in manner such that every alphanumeric combination is a HIT! A5 – HIT! J10 – HIT! G7 – HIT! After every hit, they explode in a frenzy of high fives, backflips and tail wags. They congratulate each other too; it isn’t a game with enemies…it’s one of friends. Locked in brotherly love and sheer joy they celebrate with every sunk ship, with each celebration more ruckus than the last. That my friends, was going on in my mouth. After every bite. Now if you’ll excuse me, I’m going to go smoke a cigarette and play Battleship.